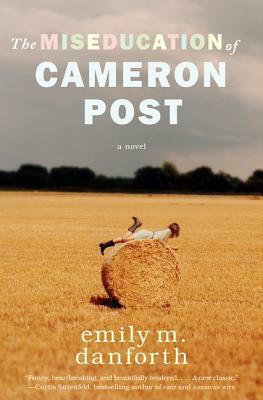 The Miseducation of Cameron Post by Emily M. Danforth. Grades 9 and up. Balzer + Bray, February 2012. 470 pages. Review copy provided by my local library. Cameron Post kissed her first girl, her best friend Irene, when she was twelve. Almost immediately after that, her parents died in a car crash, leaving Cameron to live with her grandmother and her conservative, religious Aunt Ruth. Growing up in small town Montana, Cameron has to hide the fact that she's gay, but that's not a huge problem until beautiful Coley Taylor moves to town. Coley Taylor seems perfect - with a perfect boyfriend to match - and immediately Cameron is smitten. What happens next will change everything. This book was vaguely on my radar, but it was after I heard some teens talk about it at the BFYA teen input session that I decided to pick it up. I'm glad it was teens that encouraged me to pick it up because otherwise I might doubt the teen appeal of this book. Yes, it's a story featuring a teen protagonist as she discovers her sexuality and deals with the seeming conflict between her sexual nature and the religion she's forced to participate in. But it's told with a certain distance and reflection that is not typical of most YA books and the early-90s setting is going to resonate more with adults than teens. Although it's being published as YA, it reads like an adult book featuring a teen character. That's not at all to say it's BAD, but it's just something to consider as you pick up this book. It reminded me most of Wally Lamb's She's Come Undone, which is an adult book that I loved as a teen. For this reason, I think this is a YA book that has a lot of crossover appeal for adults. The book is well-written with some very striking imagery. I've never been to Montana, but Emily Danforth brings the sunbaked Montana summers and the bitter Montana winters to life. Even though there's a distance between the reader and the protagonist, I felt very much invested in Cameron's story. I'm not surprised to find that parts of it are based on the author's adolescence. I also loved the supporting characters... Coley, Cameron's first love, the kids she meets at Promise, her Aunt Ruth who truly believes she's doing right by Cameron, Cameron's grandmother who sneaks sweets at every opportunity despite her diabetic diet. This isn't going to be a book for every reader. I think the style might turn off some teen readers, although it's also what might attract certain readers. I'd hand this one to your teens (GLBT or not) who are starting to turn their noses up at YA books and reach for stuff in the adult section. The Miseducation of Cameron Post is on shelves now!